Reflex One Stop Xtreme is our best selling all in one gainer at Echo Supplements. One Stop Xtreme boasts an ingredient profile that many brands imitate but none come close to; from high quality protein (no soy) and carbohydrates (no sugars) and with active ingredients like Creapure creatine monohydrate, beta alanine and branched chain amino acids in HIGH doses you can trust Reflex One Stop Xtreme when looking to add strength and size! Quattro Protein - This is a blend of whey protein concentrate, isolate and hydrolysate alongside milk protein concentrate (high in casein). This combination provides a good comproimise between fast and slow releasing protein sources for a truly time released protein blend. Importantly it does not contain soy protein. At Echo Supplements we believe the above ingredients are the most important parts of Reflex One Stop Xtreme, and have highlighted them for this reason - you can find the manufacturer's decription below for even more information! One Stop Xtreme is the ultimate all in one bodybuilding supplement; in fact we firmly believe it’s the best of its type in the World. Why? Well at Reflex Nutrition we’re experts at making all in one bodybuilding supplements, we’ve been making them much, much longer than most, our first was made way back in 1997. So our experience is really second to none and as a result One Stop Xtreme delivers a complete powerhouse of the world’s finest sports supplements in research based doses all in one easy to use shake, and with more high-quality ingredients than ever before. Who Is One Stop Xtreme For? What Are The Benefits of Reflex One Stop Xtreme? “There are a number of all-on-bodybuilding supplements on the market at the moment. We’ve always see OSX as the market leader in terms of composition and quality since it contains numerous premium ingredients like Creapure Creatine and has always been free from soy protein. But now we’ve really taken things to another level with OSX. The partnership with Albion, the addition of Betaine Anhydrous and the work with LAB2PRO means that OSX is in a different league”. How Is One Stop Xtreme Made? Reflex Nutrition’s state of the art all in one bodybuilding supplement One Stop Xtreme is made at the Reflex Science Park in the U.K, it is one of only a handful of factories in the World which is ISO9001 registered for quality control but is also an Informed Sport Registered Site. Each and every batch of One Stop Xtreme is carefully made to exacting quality control and auditing procedures ensuring 100% traceability of every high quality ingredient that goes into producing this market leading all in one supplement. At the end of each run every single batch is then tested in our lab to qualify its label claims for protein content. Be in absolutely no doubt the quality and effort that goes into making this bodybuilding supplement. Each serving of One Stop Xtreme contains everything a bodybuilder needs from a protein supplement. Its designed to outperform the competition in every single conceivable angle see table. One Stop Xtreme is not the result of guesswork, its is the result of decades of experience and the ability to understand and extrapolate real data from real studies relating to sports performance. As a result it is not by chance that One Stop Xtreme delivers 55g protein, 10.3g BCAAs, 73g low GI carbohydrates, 5,000mg Creapure Creatine, 100% RDA of daily vitamins, LAB2PRO friendly bacteria and DigeZyme digestive enzyme complex, every shake delivers a powerful serving to ensure you get the most out of your training and diet. Added amino acids include pure free form L-Leucine; Beta Alanine; Betaine Anhyrdous and Taurine. Vitamins and minerals, including patented Albion zinc and magnesium, contribute to the maintenance of normal protein synthesis, normal function of the immune system, normal testosterone production, protein synthesis, and normal cognitive function. Quite simply, it is the Benchmark by which all others are measured. Reflex One Stop Xtreme is suitable for those following a vegetarian diet. Mix 145g (approximately four and a half level 60ml measures) with 400ml of water and mix thoroughly in a shaker cup or blender. On training days take one serving mid morning between meals and one serving after your workout. 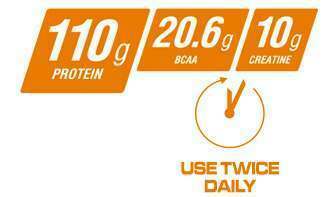 On non training days take two servings, one mid morning between meals and one serving in the afternoon between meals.